Melissa was the co-host today, so she called the meeting to order with a ring of the bell, and a welcome to all. 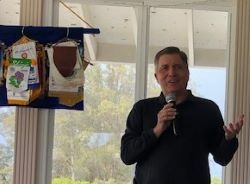 GUESTS: Mary brought Ann Byerly from the SLO Monday Rotary Club who had an announcement: Saturday, March 23rd they will be holding their annual Spaghetti Western Fundraiser at the Vets Club in SLO. Buy your tickets on their website - sounds like a fun event and all monies made will go towards high school scholarships for deserving students. 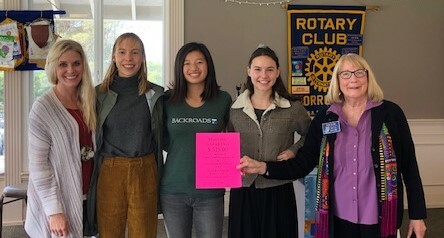 Dean Sullivan visited for the second time and brought copies of the first edition of their newspaper, The Estero Bay News; Tom Russ, visiting us for the fourth time; and Interactors Audrey McClish, Annalise Dempsey and Kinsey Flaghterly were here with Andrea. 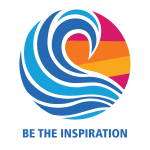 The Interactors have helped with the Avocado Margarita Festival, the Fall Carnival, Canned Food Drive for SLO, The Human Trafficking Summit, the Women’s Shelter in SLO, as well as many other things - Great Job!! They have several thousand dollars in their account to use when they decide what charity they would like to use it for. Katherine is heading up the Dodgers vs Giants baseball game trip. We will possibly be going by bus or maybe we can see how many cars we will have going. Tomorrow is mock interviews at Cuesta College - Jude is going to be our representative. Judy was introduced and congratulated for receiving the Lillian Dean Award, for all the things she has done in the community as an advocate for Writers. We are thankful she is a vital part of our Club. Congratulations Judy!! Crab Feed Meeting: Pete said if everyone sells 4-l/2 tickets, we will sellout. Start thinking about who you can invite, and if you have something you can offer for our silent auction. All Ideas for making more money on this fundraiser are both invited and appreciated. 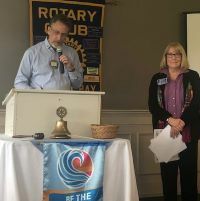 Judy introduced our special speaker today, Chris Aho, the Development Director of the 25th Annual SLO Film Festival. The Festival has long been considered to be one of the best independent film festivals in the country. They have 60-70 screeners to watch all the films and narrow those making “the cut” down to 70, which will be shown in Paso, and Morro Bay as well as downtown SLO. Some are as short as 3 minutes and can be up to 30 minutes or longer; also, some are heavy and some have a lighter topic. It starts on March 12 and will be six days of film, wine and fun on the Cinematic Central Coast. There are also special events including the appearance of Katherine Ross and her husband Sam Elliot, with the showing of Butch Cassidy and Sundance Kid. They have a special section for youth film makers who will also have a chance to get an award, or have their film viewed. Saturday night they will be giving a Life Time Achievement Award to someone in the film business, who has yet to be named. Their website is www.slofilmfest.org if you are interested in getting tickets or volunteering. Teri Bayus has made a film that will be shown. John Weiss came up to do the fining – ending up fining Judy $10, Melissa $25, Jack Keely answered correctly but was still fined $25, Pete Starlings $10, Nick $10, Mike W and Williams $10. John has thru the month of February to fine us all – be on the lookout. Mike Pond mentioned that Chiara won an international math contest and was awarded $2,500 which she is using for her train trip. It seems Chiara loves math and science.....Good Job, Chiara. Jude’s quote for today was from “64 Ways in 64 Days” - encouraging Peace. Thanks Jude. Next week we will have Craft Talks - one of my favorites, getting to know our members better. See you then. Enjoy the sunshine.